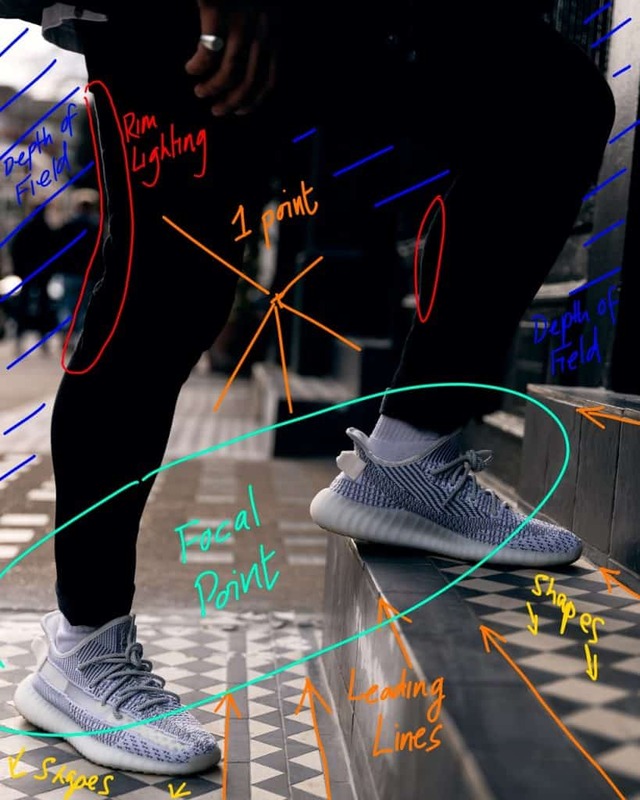 Sneaker Photography is a niche photography that has always had significant popularity and in this blog article I'll go through everything you need to know to get the best photos. I recently did some sneaker photography with a good friend of mine, Naz aka @londonboyblog, a fellow creator and blogger. Go check him out on Instagram, his content is some of the best out there, and worth a follow. Having experience in product photography I felt I had the necessary skills. But I quickly discovered a few new things particular to photographing sneakers. 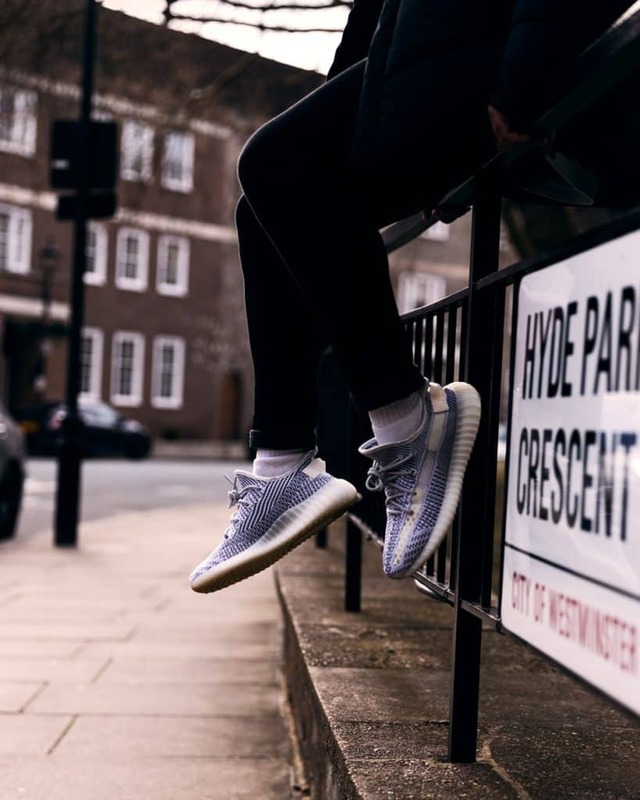 We wanted to photograph some of his sneakers with interesting outdoor backgrounds and there is no better place than London. Naz gave me an idea of what he wanted from some Instagram inspiration. 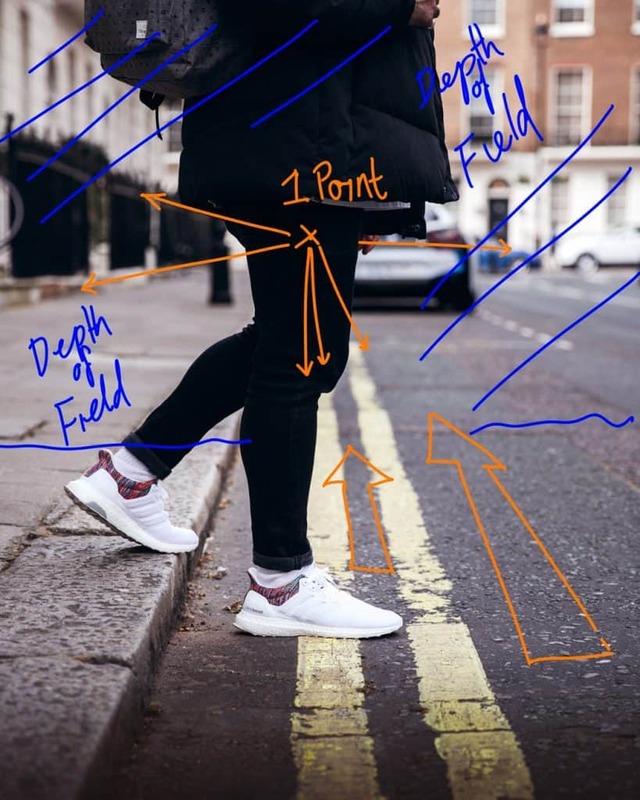 Some of the more notable photographers employed techniques like shapes and leading lines to frame the sneakers. This helps to direct the viewer’s focus to the point of interest, the sneakers. Naz wanted blurry backgrounds for the shots, which made artistic sense. A shallow depth of field further emphasises and helps frame the point of interest. Following this brief from Naz, I decided on bringing my Canon EF 24-70mm L USM lens. The zoom would give me a good variety of focal lengths. And the F2.8 would help me achieve the shallow depth of field. I could have also brought my Canon EF 50mm F1.8 STM but decided it would be superfluous, and I always prefer to be as light as possible when shooting on location. Check out my current gear on Kit.com to see what I use on location. My initial plan was to meet up early and scout some locations in preparation for the actual shoot at sunset, to take advantage of golden hour. Golden hour is that time of the day just after sunset when because of the sun being so low on the horizon there is more indirect light illuminating the sky. The light is more diffuse, resulting in more yellows and reds in the sky, producing those golden colours photographers seek to capture in their photos. This along with softer and longer shadows results in better lighting for photos. Unfortunately British weather can be quite fickle. There is usually more chance of grey skies than golden. So as not to get let down by the weather later we started taking shots right away. It was a sunny day which was promising for later. Shooting at wide apertures on a sunny day will result in over exposed photos if you don’t dial in the right settings. I used the lowest ISO setting and fast shutter speeds to compensate for the wide aperture to correctly expose for a shallow depth of field image. If it’s still difficult to get a correct exposure, using a Variable Neutral Density filter should give you a few extra stops back. But this is at the expense of possibly getting some artifacts in the out of focus areas, dependant on brand of the Variable ND you use. You could use regular ND filters to avoid possible artifacts but I find swapping ND filters ruins the flow in a photo shoot. I limit their usage to landscape photography. As it so happened, the weather did take a turn for the worse, and golden hour was actually grey hour. Grim greys across London. Fortunately we were able to take a few decent images during the day to take to the studio. Sneaker photography shares a lot of parallels with regular product photography. It is after all a product too. And requires the same attention in particular areas. It was important that the sneakers, especially if they are white, are kept in pristine condition. Wear and dirt will ruin the shot and would require superfluous editing in Photoshop to correct. Naz would pop the sneakers in his bag and put on some regular trainers in between travelling to the next location to minimize the chance of getting them dirty. We kept some wipes and cleaning materials if the sneakers needed a quick cleanup. Laces were laced up and the knots tied to Naz’s aesthetic preference. Mismatched laces and asynchronized knots cannot be corrected in post. The first image chosen was of the Adidas Ultra Boost White Rainbow trainers. In this image we utilised the double yellow lines as leading lines to direct the eyes to the Adidas Ultra Boost trainers. Leading lines are a great way to direct the viewer’s attention. In this image I have used a one point perspective to make the eye flow towards the point of interest. Shooting at F2.8 and a high shutter speed allowed me to achieve the shallow depth of field we were after. Adding extra sharpness in post to the trainers added more contrast to further emphasis the trainers. The next image featured the Adidas Yeezy Boost 350 V2 grey sneakers, a personal favourite of mine. In this image I got Naz to sit on a pavement railing to get some elevation for a more unique perspective. I used the same techniques as Image 1 for leading lines and one point perspective. In addition I filmed into the direction of the sun to achieve some natural rim lighting, which really pops on the knee. The final image selected to post to Instagram again featured the Adidas Yeezy Boost 350 V2. This one was my personal favourite of the day and utilized every technique employed in the latter two images. We have the leading lines with the foreground steps leading perfectly towards the focus of interest. We also have interesting shapes in the steps that add a further dimension of contrast. This again was also shot into the sun to create that beautiful rim light. This adds definition to the trousers to create separation between subject and background. And also allowed me to crush and lift the blacks on the trousers in post, which added tonal contrast. As I said at the outset, this was my first time photographing sneakers in a lifestyle product style shoot. My previous experience is weddings and product photography for online selling. So while I have a wealth of experience to call upon, I just had to modify it for photographing sneakers outdoors. Sneaker photography posing is vastly different and varied. The best ones that tick all the boxes showcase the sneakers at their best. I tried to make sure the sneakers were always the sharpest part of the image; that the logo, if available, was on show; and that the image was exposed for the sneakers. Next time I will definitely try some different angles and framing, sticking to the mindset I had for the shoot: to try to find new compositions to frame the sneakers. Interaction with the foreground is definitely something I will try. Puddles, sand or soil would help bring extra dynamism to the image. Of course the issue is keeping the sneakers clean! This would mean ‘one chance to get the shot right’ type of images. I will definitely do more sneaker photography in the future to expand on my experience in this area. Despite the market for sneaker photography being saturated, I feel there’s also lots of room for improvement and experimentation for me. Also if you want to see how I edited the Image 2, check out my YouTube channel for the video. And for more images check out and follow me on Instagram.